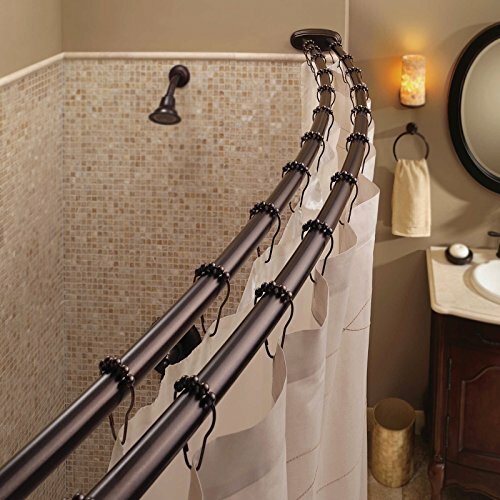 The Bennington oil rubbed bronze adjustable double curved shower curtain rod is sure to transform your bathroom without having to remodel. Provides up to 6 inches more elbow room in the shower. The rod adjusts from 60 inches to 72 inches and holds up to 30 pounds. The shower rod features a patented Snap-Fit Technology that makes installation quick and easy with only a few tools required. The double curved shower rod fits all standard bathtub enclosures and come packaged ready for installation. Please note this product must be mounted to the wall. All hardware is included. Securely mounts to wall with included hardware. Features Patented Snap-Fit Technology for quick and easy installation.